Celebrate and Explore Singapore’s Heritage at KidZania Singapore this March and April. From 16 March to 21 April 2019, KidZania Singapore celebrates Singapore’s progress and achievements as part of its inaugural KidZ & Heritage event, with activities and opportunities that shine a spotlight on Singapore’s founding and development. 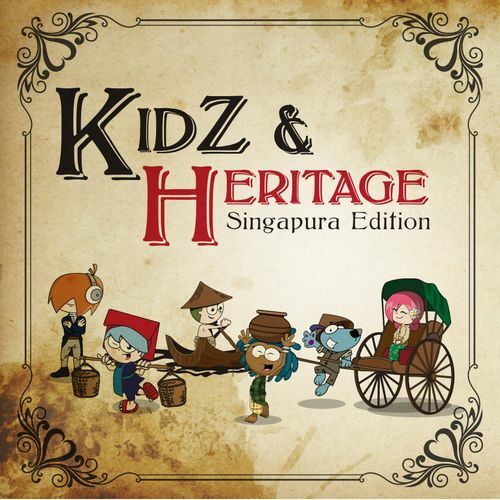 Learn more about Singapore in the inaugural KidZ & Heritage as Singapore’s bicentennial commemoration heats up! - Chinese Dance Performance by PCF Sparkletots @ Pioneer Blk 987D on 13 April (Sat), 1:45pm at the Main Square Visitors on 13 April 2019 (Saturday) will be treated to a unique art form that showcases the beauty, vibrancy and diversity of the Chinese culture. Kids can experience a blast from the past and learn how these occupations were conducted in the olden days. - ‘History of Singapore’ Trivia Hunt around the City - Kids can put their knowledge of Singapore’s history to the test as they look for clues and complete a trivia quiz to redeem extra kidZos! From 16 March to 14 April, kids can get creative and express themselves through art by taking part in MuzArt’s drawing competition. There’ll be different categories for kids aged 3 to 6, 7 to 9, and 10 to 12, with attractive prizes up for grabs, including free art classes and KidZania Singapore tickets! Winners of each category will be announced on 21 April (Sunday). KidZania is an indoor family education and entertainment centre, which offers an interactive learning and entertainment experience targeted at kids. KidZania combines role-play with real life, creating a kid-centric city experience designed to educate and inspire kids; from arriving at the airport, to visiting a city centre to exploring the city streets. As in the real world, kids choose activities—such as being a pilot, police officer, doctor, journalist or a customer—and earn money, which they can then spend or save. KidZania operates just like a real city complete with buildings, paved streets, vehicles, a functioning economy, and recognisable destinations in the form of “establishments” branded by leading international and local brands. The facilities are designed to educate through experience, fostering the development of life skills, but from a kid’s perspective it is all about fun which truly epitomizes learning through play. Being one of the fastest growing educational and entertainment brands in the world, KidZania has won numerous awards, having been voted “Best Theme Park Worldwide” by The Themed Entertainment Association, “Top Family Entertainment Centre of the World” by the International Association of Amusement Parks & Attractions (“IAAPA”), “Global Leisure Operator of the Year” by Retail and Leisure International and “Concept of the Year” by MAPIC. KidZania Singapore is a subsidiary of Themed Attractions Resorts & Hotels Sdn. Bhd., the investment holding company responsible for the development, management and operations of various hospitality and attraction destinations in Malaysia and Singapore.